Loki, who is famously one of Thanos's first victims in Avengers: Infinity War, will live again thanks to Disney's brand-new streaming service. Apparently the villain's quip about "no resurrections this time" wasn't as permanent as we all feared! In a series of announcements made by the studio on Thursday, it was revealed there are plans to assemble live-action TV series around fan-favorite characters from the Marvel and Star Wars universes. 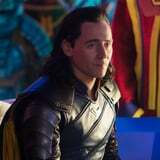 In addition to a show centered on the antics of Rogue One's Rebel spy Cassian Andor, once again played by Diego Luna, Disney Chairman and CEO Bob Iger shared that the streaming service - officially titled Disney+ - is developing a show all about Tom Hiddleston's Loki, the god of mischief. Hiddleston confirmed the news himself with a post to his Instagram page. "Loki. More stories to tell. More mischief to make. More to come," he wrote. Other details about the series have yet to be unveiled, including a release date. But since Disney+ is scheduled to launch in the US in late 2019, it stands to reason that the Loki series will be ready at that time or shortly afterward. At this point, all we can do is cross our fingers that Thor makes it out of Avengers 4 alive so he can make a few cameos.